What Day Of The Week Was October 23, 1970? 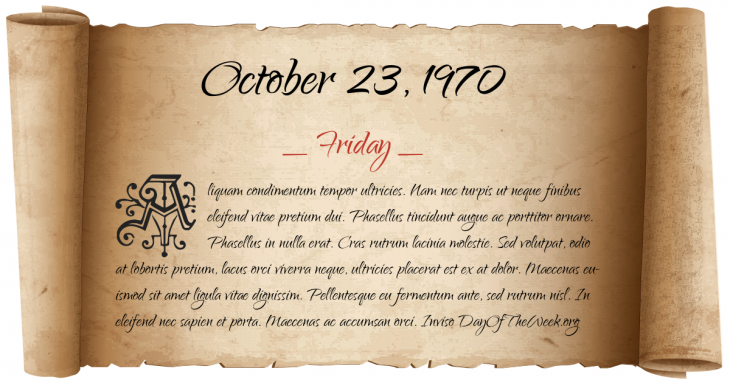 October 23, 1970 was the 296th day of the year 1970 in the Gregorian calendar. There were 69 days remaining until the end of the year. The day of the week was Friday. A person born on this day will be 48 years old today. If that same person saved a dollar every day starting at age 7, then by now that person has accumulated $15,153.00 today. Gary Gabelich sets a land speed record in a rocket-powered automobile called the Blue Flame, fueled with natural gas. Who were born on October 23, 1970?